This item contains the reminiscences of Eliza J. Wyckoff, who left Ohio with her husband Isaac Wyckoff in the fall of 1868 to move to Kansas. 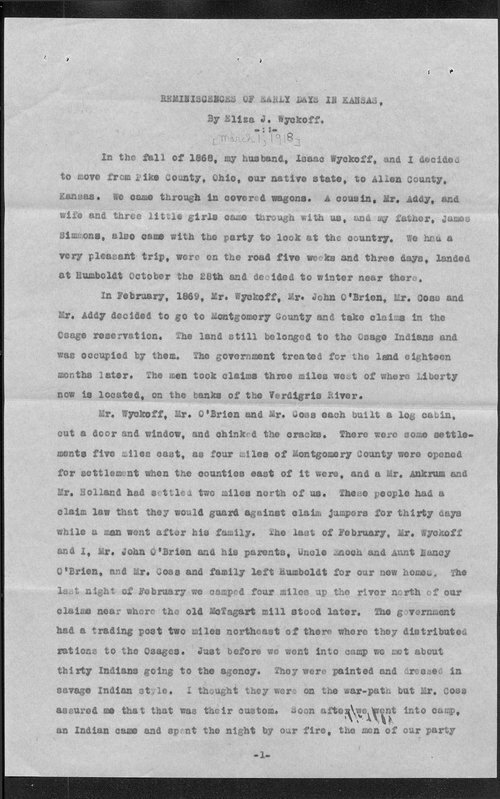 Mrs. Wyckoff recalls that her husband was one of three men that "took claims" on land that was then contained within the Osage reservation. Regarding the inhabitants, she states that the Osage people "were painted and dressed in savage Indian style. I thought they were on the war-path but Mr. Cose assured me that that was their custom." People - Notable Kansans - Baude, Eliza J.